CEA-608-E R-2014 is a technical standard and guide for using or providing Closed Captioning services or other data services embedded in line 21 of the vertical blanking interval of the NTSC video signal. This includes provision for encoding equipment and/or decoding equipment to produce such material as well as manufacturers of television receivers which are required to include such decoders in their equipment as a matter of regulation (see Annex F). It is also a usage guide for producing material using such equipment, and for distributing such material. 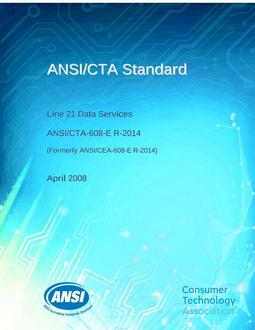 This standard describes the specifications for creation, transmission, reception, and display of caption data, plus the relationship of Caption Mode data to other line 21 data. A comparison of decoders meeting Federal Communications Commission (FCC) rules to all decoders designed prior to the drafting of those rules and a timetable for the implementation of features which are unique to the different generations of decoders are retained from the prior version.